Barb Randall got a sneak peek at the upcoming Taste Washington event happening March 28 through 31 in Seattle. You can sample wines from 235 of Washington's wine producers, and foods from 65 restaurants. Learn more here. Willamette Valley wines have been near and dear to my heart for a long time, and always will be. But recently I felt a pull to venture outside the state and experience what Washington has to offer. There are 970 wineries in Washington and they grow 70 different varities of grapes. I have discovered some delicious wines and want you to experience them, too. I was invited to take a special sneak peak into Taste Washington 2019 with a special dinner prepared by Chef Vitaly Paley and Chef Kenny Giambalvo at their new restaurant, Rosa Rosa in Portland's Dossier Hotel. They prepared a Pacific Northwest-inspired dinner which was paired with Washington wines from Brook & Bull and Vital Winery, Spring Valley Vineyard and Armstrong Family Winery. Winemakers Ashley Trout (who, by the way, is one of Wine Enthusiast's Top 40 under 40 Tastemakers for 2018), Serge Laville and Tim Armstrong shared stories of their history and wines. The menu prepared for us at Rosa Rosa included a very memorable and delicious first course of Insalata di Frutti di Mare (prawns, clams, calamari, octopus, shaved fennel, herbs and lemon) that paired beautifully with Brook & Bull 2018 Rose, Armstrong Family Winery 2015 Scotsman Syrah and Spring Valley Vineyard 2014 Uriah Red Blend. Next came a risotto of foraged mushrooms, winter black truffle and Parmesan served with Brook & Bull 2016 Vital Winery GSM, Armstrong Family Winery 2015 Four Birds Red Blend and Spring Valley Vineyard 2015 Frederick Red Blend. The third course was Merluzzo Cotto in Crosta di Erbe (Ling cod baked in herb crust, baby spinach, pine nuts and raisins) and Brasato al Barolo (braised beef cheeks, winter vegetables, garden herbs) paired with Brook & Bull 2016 Malbec, Armstrong Family Winery 2015 Reserve Cabernet Sauvignon and Spring Valley Vineyard 2013 Nina Lee Syrah. And for dessert Torte al Cioccolato (Gianduja mousse, orange marmalade, hazelnut and cocoa nib crunch) paired with Domaine Ste. Michelle Brut Rose. Sounds elegant, doesn't it? It was heavenly. Clear your calendars, friends. You can experience something quite similar by attending Taste Washington happening March 28 through 31 in Seattle. 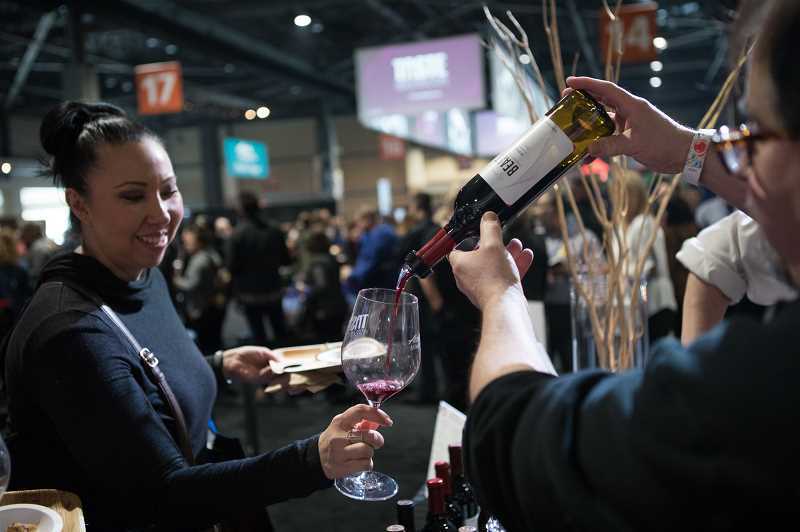 Taste Washington is the nation's largest single-region wine and food event and features more than 235 Washington State wineries and more than 65 Pacific Northwest restaurants. The event was launched by Washington State Wine in 1998, and is now produced by Visit Seattle. The festivities begin with the Red & White Party March 28, an intimate and exclusive experience which takes you "into the cellars" of Washington's premier winemakers to taste the best of the best. 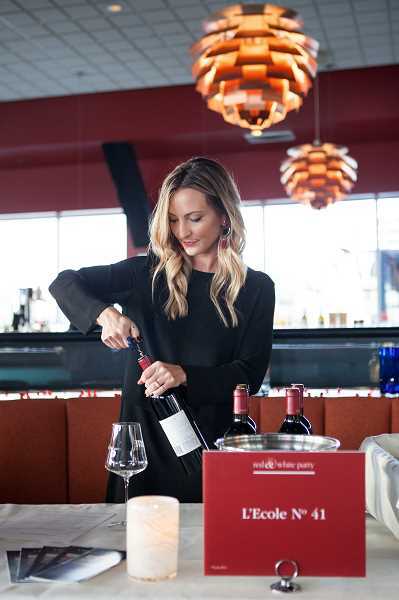 This is where you will find the winemaker's most coveted bottles, including wine club-only bottles and 90+ point pours. There are two Tasting Washington on the Farm events March 29. Attend Oxbow Farms — Food, Farming & Cultivating Roots, where Musang Seattle Founder Melissa Miranda will partner with Buty Winery, Hightower Cellars and Three Rivers Winery, or Fall City Farms — The Art of Sourcing Local, where Chef Maggie Trujillo of Aerlume will partner with Chateau Ste. Michelle, Damsel Cellars and Pepper Bridge Winery. Both events include a farm tour, lunch and pairings along with great conversation with the farmers and winemakers. The New Vintage is an unforgettable experience that delivers stories in the form of food and wine. This event is your backstage pass to meet and mingle with Seattle star chefs and friend chefs from around the country (including Gregory Gourdet of Departure Restaurant + Lounge in Portland). The seminars are hosted by some of the nation's leading experts including top winemakers, Master Sommeliers, wine writers and academics. Test your knowledge in blind tastings, learn what makes the terroir of Washington's vineyards stand apart, dive headlong into the latest wine science, and of course, taste a lot of fantastic wine. The Grand Tasting takes place Saturday and Sunday, March 30 and 31 at CenturyLink Field Event Center. Besides being able to sample wines from the 235 Washington wineries and 65 local restaurants involved, there are chef demonstrations to watch and so much to learn. It's a good thing it is held over two days — you'll need that much time to absorb all that you will see and taste. The weekend concludes with Sunday Brunch, a perfect way to gather friends and round out your festival experience. This year the brunch is a coast-to-coast experience as the Boston Red Sox happen to be in town for opening weekend. Seattle Chef Tom Douglas and culinary pal from Boston will handcraft a unique bi-coastal brunch menu, and serve it family style at Palace Ballroom with your favorite brunch cocktails. Tickets to seminars range in price from $50 to $85; other events range in price from $75 to $210. Special ticket packages are available and include special "jump the line" privileges and much more. Head to Seattle and raise a glass to Taste Washington. The complete lineup of events and ticket information can be found online at tastewashington.org. I love a good mushroom risotto and Rosa Rosa made the best. Its earthy taste paired beautifully Armstrong's Four Birds Red Blend. I've included a favorite mushroom risotto recipe that you can make at home, but you might prefer to taste Chef Vitaly's at Rosa Rosa. It is located at 750 SW Alder St. Portland OR 97205. Heat 1 tablespoon oil oil in a large skillet over medium heat. Add 1/2 onion and 1 clove garlic, cook, stirring, until translucent, about 5 minutes. Add the fresh mushrooms, herbs and butter. Saute for 3 to 5 minutes until lightly browned, season with salt and pepper. Drizzle in truffle oil then add the dried porcini mushrooms which were reconstituted in 1 cup of warm chicken broth. Season again with salt and fresh cracked pepper. Saute 1 minute then remove from heat and set aside.